Harry Meyen was born as Harald Haberstock. He was the son of a Jewish merchant. He appeared in second rate plays before he was engaged at the Thalia Theater in Hamburg. From the end of the 1940s onwards he also played in movies. In 1953 he married the actress Anneliese Römer. He had his best movie parts in the early 1960s, when he appeared in "Liebling der Götter" (1960) and other productions. In 1965 he met Romy Schneider in Berlin. He divorced Anneliese in May, 1966 and married Romy on 15 Jul 1966 at Saint-Jean-Cap-Ferrat. She was already pregnant at the time and in December their son David was born. During the early 1970s Meyen appeared in German crime productions for television, like "Derrick". He also worked as a director but he couldn't live up to the high expectations of the people around him. In 1973 he seperated from Romy and in 1975 they divorced. Meyen asked for half her fortune, threatening to claim the care for their son. He got his money but he suffered from the separation of his son and professional engagements became scarce. Meyen started drinking heavily and in 1979 he hung himself in his house in Hamburg-Harvesthude. He was found by his last companion, the actress Anita Lochner. He was buried at the Ohlsdorf Cemetery in Hamburg. In 1981 his son David killed himself when he was climbing a spiked fence in Paris. Romy Schneider felt responsible for Harry's death and noted in her diary that she should have taken better care of him. The death of her son was a heavy blow to her and she died in 1982 after taking an overdose of sleeping pills. 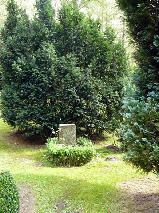 Meyen's first wife Anneliese died in 2003 and was buried in Berlin. 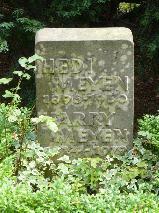 The grave of Harry Meyen at the Ohlsdorfer Friedhof, Hamburg.